You can save hundreds of dollars a year on food costs by eliminating spoilage and waste, and in most cases, a savings in electricity. Sounds impossible, but users report that it actually lowers the refrigerator temperature. They say food remains fresh two to four times longer than usual. Saves on food costs by reducing spoilage, and cuts electricity costs as well. Nontoxic, no chemicals, and units first manufactured 20 years ago are still functioning as new. The inventor, Ralph Bergstresser, said that in 1978 the Canadian Government ran tests on this device: "They found that by placing the 'Fridge Freshener' in a home refrigerator, a saving of $4.00 per month on electrical consumption resulted from its use," he said. "This was an added feature that was never anticipated. Most thermostats must be raised on home refrigerators, otherwise the food will freeze … and, of course, this saves energy." 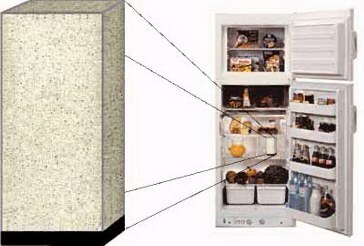 The cube ( 5 " x 2 1/2" square) is placed on the center shelf of a home refrigerator. Should there be any odors, they will gradually disappear, but do not expect this to happen instantly … several days may be required. The efficiency of these units increases with time and you will gradually notice that foods remain fresh and useable longer than normal. This will vary depending on how old the product was before it was placed in your refrigerator. Uncooked meats, fish and foul remain fresh only slightly longer than normal, but after they have been cooked, they remain fresh and useable for much longer periods of time. Energy is continuously emitted from these units in which the atoms of the crystal materials have been reoriented into what might be considered a "single crystal". They have zero resistance with higher energies and create what might be considered a "bubble" of positive energy. This field of energy has the ability to slow deterioration of all types of food without affecting the taste or flavor.